Have You Been Looking for Sporty Turfs? There is nothing like the start of the new football season, or in the case of this summer, the Olympics to inspire you sports wise. We here at Great Grass are certainly guilty of enjoying the football season, perhaps a little too much. This, however, brings us nicely to the topic of today’s article. Artificial grass on sports pitches. So,have you been looking for Sporty Turfs? As well as in private properties, modern artificial grass is fast becoming common place for many sports pitches the whole world over. It isn’t just football and rugby grounds either, that are switching from the more traditional turf to artificial grass. Many a recreational clubs, both professional and semi-professional have been reaping the benefits of these versatile, long lasting turfs. So, what is all the fuss about? Well, there really are too many benefits to mention, but if we did have to have to choose two such benefits to discuss, it would have to be the texture and versatility. Let us first have a look at the texture. By design, artificial grass makes gameplay faster and smoother, for ball games, in particular, movement is vastly improved when played on artificial pitches. It can, in fact, improve the overall game, making it faster paced and a real thrill to watch. When it comes to artificial grass’s versatility, it really will stand up against all of the elements. Many sports clubs are investing in commercial artificial grass, due to the materials weather resistant properties. In wet weather, artificial grass eliminates the risk of injuries caused by slipping on a muddy pitch, as well as, allowing play to continue at an uninterrupted pace. Equally effective in extreme heat, your artificial grass will not dry up. 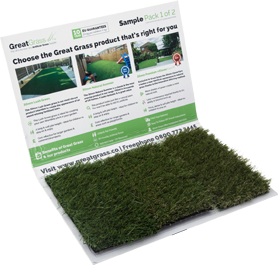 So, is it time for you to switch from an old patchy turf to a newer sleek artificial grass product? Well, it is time for you to come and speak to us for all of your artificial grass requirements.